What kind of studies took place here? Are there still a few classes happening underneath the building? 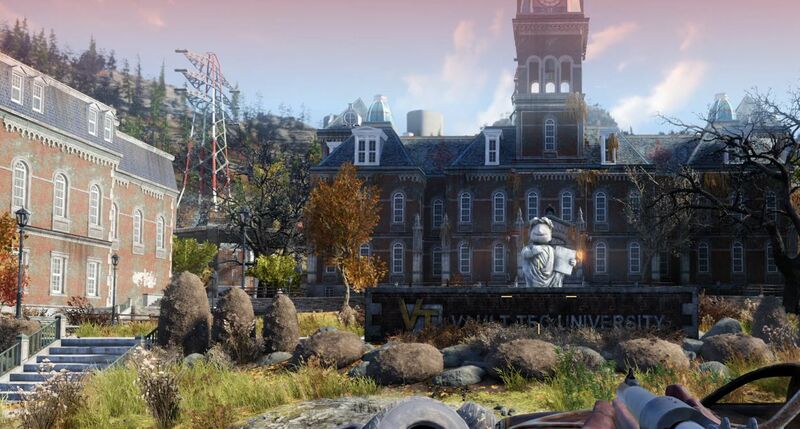 When diving into Fallout 76 during a three-hour hands-on demo, I found a couple opportunities to journey off on my own. Most of the time, I found myself getting destroyed by the scattered ghouls and mutants, but, on one occasion, I came across the Vault-Tec University and survived to tell the tale. I didn't have any particular quest or event telling me to go here, but I decided to explore a bit anyway. On top, I found a dilapidated school. I found a solid looking foor, however, that took me down into a space that looked a lot like the interview of Vault 76. There were locked doors, a few enemies, and more in this intruiging space and I'm curious to see what type of quests unfold inside the building and vault. Check out the full video below and read my take in the full Fallout 76 hands-on. You'll be able to enroll in a few courses of your own when the B.E.T.A. goes live October 23 for Xbox One players and October 30 for PS4 and PC players. Check out the Shacknews and GamerhubTV YouTube channels for exclusive interviews, walkthroughs, gameplay, and more.